One size does not fit all when it comes to membership options. It’s important to have choices and not be told that there is one way to belong. Your choices should be well thought out and grow with you as your both your business and career grow, and as your relationship with the organization strengthens over time. These principles were central to the create of NJACCA’s new membership structure. NJACCA’s new offerings are both amplified and simplified – meaning more features, more ways to engage, and more cost-effective payment plans. 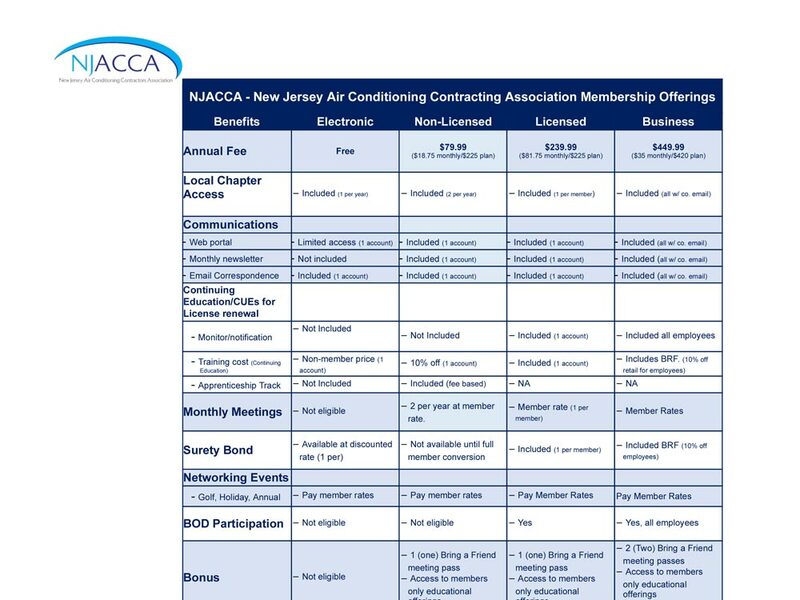 The changes center around one goal, keep NJACCA on the growth trajectory it has enjoyed since becoming an independent, yet affiliated, organization from the national Air Conditioning Contractors Association (ACCA). * This relationship with ACCA, and the fact that NJACCA focused solely on the HVACR industry and nothing else, gives us the ability to bring the latest news and education to our members both electronically and in person at our regular membership meetings and other educational events. Access to in person networking and educational events. Those events will include the opportunity for NJACCA members to earn the CE credits needed to renew their Master HVACR License, free of charge. CE registration alone would cost $300 – $400, even after factoring in the discounts that some organizations provide. A complimentary surety bond (requirement for licensure) and discounted access to health care insurance through the Association Master Trust. Your membership also strengthens our industry’s voice in the halls of the statehouse and with key state agencies. Having the strongest possible voice is more important than ever as NJACCA works to make sure that our state government is passing common sense measures that help customers, grow businesses, and strengthen the overall health of our industry. Being solely focused on the HVACR industry puts us in the best position to advocate for the true needs of HVACR professionals from across the state. If you will need to renew your Master HVACR License, access to free CE credits will more than cover the cost. Business Membership: Everyone in your organization** will be a member. The cost of the business membership ($450) is slightly more than the current individual membership, making it a savings for two or more . Business memberships also offer several additional discounts as a special thank you. Individual Membership: Ideal for smaller businesses – entitles one person in your company to all that NJACCA offers. E-Membership: Includes access to NJACCA’s growing library of content and enables you to say that you are actively supporting our work in Trenton. Does not include the in person benefits of other membership categories. Not sure what’s right for you? That’s ok – NJACCA also offers a trial membership to give you the chance to see first-hand, for yourself, all that membership offers. That’s the big picture…the chart below tells even more of the story. * Independent, yet affiliated means that while ACCA and NJACCA might work together in areas of mutual interest, they are two separate memberships.